Unfortunately the end of summer not only means cosy fires, hot soups and heart-warming stews and casseroles, it can also mean cold and flu season. Most of us suffer two or three colds a year, and we all have our favorite cold remedies. There are many different cures, but one of my favorites is a vitamin smoothie. 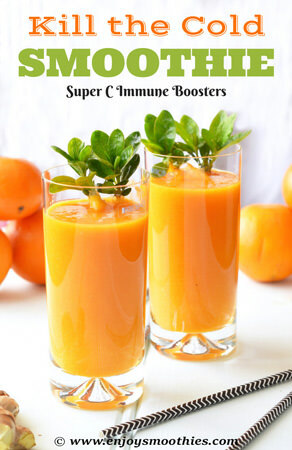 These immunity boosters are loaded with foods high in vitamin C and other cold-fighting nutrients. But don’t wait until the force of a full-on cold hits, as soon as any flu-like symptoms appear, chug down one or two of these smoothies. Rather than wait until I actually catch a cold, I like to make these smoothies regularly to encourage a healthy immune system as a preventative measure. Of course it also goes without saying that you will stay warm and get as much bed rest and sleep as you can and stay well hydrated. But I believe that it is the regular consumption of vitamin C rich foods, such as citrus fruits, berries, guava, mango, capsicum, pawpaw, parsley and pineapple, that gives you the best defense against any flu bugs. If you don’t fancy a cold drink in the winter months, we’ve included a hot remedy as well. These vitamin smoothies will not only energize you and fight off those nasty colds in winter, but are satisfying enough to leave you feeling full. Orange colored foods have high levels of vitamin C and beta carotene. This is an orange Vita C pill in a glass. Delicious! Peel and segment the orange then grate the carrot. (I find that carrots blend up much easier and quicker this way.) Add the orange segments, frozen mango, grated carrot, orange juice, grated ginger root and turmeric to your blender. Whizz on high until all the ingredients are properly pulverized and smooth. 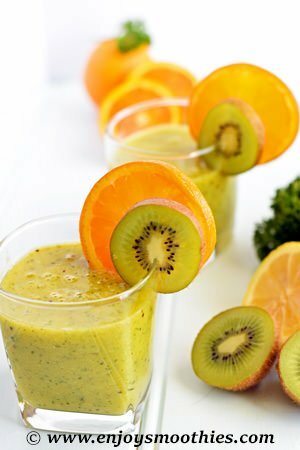 Into your blender add the frozen banana (this helps to bind the whole thing together), orange segments, kiwifruit, orange juice, lemon juice, parsley and honey. Blend on high until all ingredients are well blended. 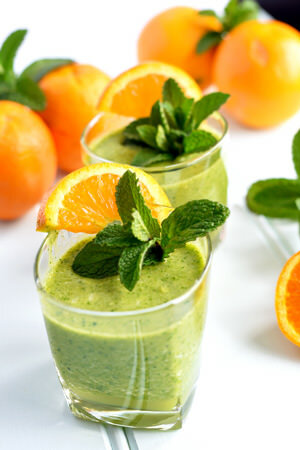 Combine the orange pieces, frozen pineapple, orange juice, water, parsley, spinach, mint and lime juice in a blender. Turn on to high and blend for several minutes until everything is smooth and creamy. Pour into 2 small glasses. This make not be the prettiest smoothie, but it sure packs a hell of a punch, loaded with Vitamin C and antioxidants. Blitz together the orange pieces, goji berries, banana, orange zest, ground cinnamon and pomegranate juice until everything is well blended and smooth. This will make 2 glasses. This is not exactly a smoothie, but is a wonderful cold remedy that I have used many times and works wonderfully. Place the lemon juice, ginger and Manuka honey into a large mug. Pour over the boiling water and add the rosemary. Let it steep for 5 minutes and drink.